Boxwood shrub cuttings make a vibrant green holiday wreath, but it can wither quickly and turn to a yellow-brown if you don't preserve the cuttings before using them for your wreath. One preservation method begins with soaking the boxwood cuttings for up to two weeks before letting them dry out for three to five weeks before using them. But you also have a quick option for preserving a wreath that's already made. Welcome fall on your porch-covered front door with a boxwood wreath. Lay the cardboard on an outside table or the ground to protect the surface on which you plan to work. Set the boxwood wreath face-down on the cardboard. 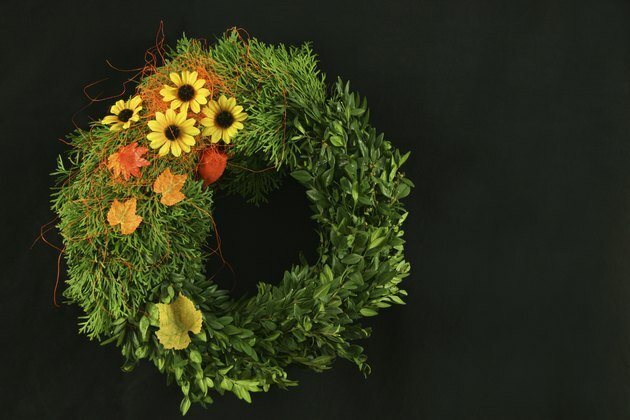 Hold the foliage sealer about 6 to 8 inches from the wreath as you spray the wreath. Make certain that all the leaves and stems get covered with the sealer. Let the wreath thoroughly dry to the touch. Turn the wreath over and repeat spraying it until it's fully covered with the foliage sealant. Store in a flat lidded box until the next holiday season rolls around. Cut branches from the boxwood shrub with pruning shears. Only select branches with healthy, vibrant leaves, avoiding branches with yellowed or dead leaves. Make the cuttings between 6 to 8 inches long. Pull the leaves from the bottom of the cut stem until you have approximately a 2-inch stem. Lightly tap the cut stem end with the hammer. This helps the plant stem absorb the liquid mixture that aids in its preservation. Weigh the boxwood branches on a food scale to learn how many ounces the shrubs weigh. You need this figure because one of the ingredients of the preservation liquid uses the weight of the shrub branches as a component of the recipe. Measure 1 ounce of glycerin for every ounce of shrubs and place it into a separate glass bowl. Mix 1 teaspoon of green dye into 1/2 cup of hot water and set it aside. Add 1 cup of glycerin to the glass bowl and pour the dye and water mixture into the container with the glycerin. Swirl the mixture until the glycerin fully dissolves. Add the remaining glycerin from the first glass bowl to the dye mixture in a ratio of 2 parts of glycerin to 1 part of water. Let the mixture thoroughly cool before adding the stems to it. Let the stems sit in the mixture for two weeks or until the shrub stems soak it all up. Remove them from the solution and place them in an area where they will remain undisturbed as they dry out for the next three to five weeks. Arrange the shrub cuttings into a boxwood wreath after drying. Cut several pieces of the floral wire into 3- to 4-inch lengths, making them into U-shapes. Set them aside. Work from the other edges of the wreath in, tying the boxwood cuttings to the floral wreath with the U-shaped wire. Add additional cuttings, keeping the stems facing the same direction, while covering the stems previously tied with the tips of the newly added cuttings. Work entirely around the wreath until the wire is completely covered with cuttings. Trim any odd ends that stick out and discard. Cut a piece of burlap about 3 1/2 to 4 feet long and about 6 inches wide. Thread the burlap through the top of the wreath to create a bow that you tack into the wall or on the door. Store your wreath in a flat box with a lid to use next season.